For other uses, see Avenger (disambiguation). "Oh, no! It's the Avenger!" The Avenger, full name CVS 1401 Avenger, was a prestigious Imperial II-class Star Destroyer of the Imperial Navy during the Galactic Civil War. It was developed by Kuat Drive Yards, with Sienar Fleet Systems, Cygnus Spaceworks, and Taim & Bak providing secondary contracting elements to its design. Its basic blueprints, or SpecPlate, had been drawn up by Raith Sienar and designed by Louis Solis. It had been commissioned by Lorth Needa under special orders. It was developed by a team under the Imperial Navy Research, Development and Engineering Center, composed of the Chief Naval Architect Lira Wessex; Chief Project Engineer J. Johnston, Senior Structural Engineer C. Cantwell; Senior Construction Designer S. Gawley; Chief Design Engineer R. McQuarrie; and Systems Engineering Director D. Beasley. Its keel had been laid, with it undergoing a naming ceremony shortly thereafter. Afterwards, it underwent the stepping of the mast, and was launched. It eventually underwent christening of the name Avenger, and had a pre-commission crew man the ship to undergo various trials. It then underwent dock trials, fast cruises, space trails, and contractor fitting out. Eventually, it was delivered to Captain Lorth Needa, and was fitted with an active service crew alongside it undergoing a shakedown cruise before it underwent official commissioning. Upon completion and undergoing its official commissioning ceremony, it had a commemorative SpecPlate placed on the bulkhead until the event where it was stricken from the registry. The Avenger pursues the Millennium Falcon. One of the Avenger's earliest missions was the attack on the CR90 corvette Karinne, carrying a Twi'lek delegation to the Rebel Alliance. The Avenger launched three flights of TIE/sa bombers against the Karinne, and entered hyperspace. The intervention of two Alliance BTL Y-wing starfighters saved the diplomatic vessel. In 0 BBY, the Avenger was under the command of Moff Kalast. When he betrayed the Galactic Empire, the Moff used his ship to secretly support the Rebel Alliance. But after giving secret informations about the Death Star to the rebels, his identity was discovered. Darth Vader tracked Kalast to Thyferra, Atzerri and other systems in the galaxy but the Moff and the Avenger always escaped. Eventually Vader managed to capture the Avenger thanks to an Immobilizer 418 cruiser. The ship was severely damaged in the battle and Kalast forced to surrender. The Avenger was subsequently returned to Imperial service. At an unknown point, the Avenger was presented with the Superior Service Award, the Legion of Merit, the Valor Under Fire Citation, the Combat Victory Accreditation, and the Meritorious Service Award by the Commander Fleet Operations. As early as 0 ABY, the Avenger was commanded by Captain Lorth Needa. Under Needa's command, the Avenger earned a reputation for subjugating planets in the Outer Rim Territories, participating in the subjugation of over 436 worlds. After the discovery of an Alliance intelligence facility on Dankayo, the Avenger participated in the brutal subjugation of the world. Alongside the Imperial I-class Star Destroyers Devastator and Relentless, the Avenger executed Base Delta Zero against Dankayo, incinerating its atmosphere and reducing its surface to slag. Eight months after the Battle of Yavin, the ship fought Warlord Nuso Esva's forces in the Poln system as part of Death Squadron. In 1 ABY, Rebel agents destroyed an Imperial depot that contained a large number of space mines intended for shipment to the Avenger. The Avenger, pursuing the Millennium Falcon out of the Hoth asteroid field, a task which gained it and its crew a reputation for persistence. The Avenger was later reassigned to Death Squadron and served as the lead attack ship at Hoth. During the course of the battle, the Avenger was disabled.[source?] However, its functions had been restored by the time that the Millennium Falcon departed from the planet during the Rebel evacuation. The Avenger unsuccessfully pursued Han Solo's fast freighter, a failure which resulted in Needa's execution by Darth Vader. Nevertheless, despite Needa's failure, the Avenger gained a reputation from the chase as it managed to continuously pursue the Millennium Falcon past the Hoth asteroid field while other ships in Death Squadron lagged far behind. During the Battle of Kothlis, the Avenger arrived alongside the Executor to disrupt a Rebel transfer with Bothan agents to acquire the Death Star II plans. The Avenger captured the CR90 corvette Razor, which held the battlestation plans. However, the Avenger's attempt was in vain, as the crew escaped with the plans and delivered them to the Alliance. The Avenger remained with Vader's Death Squadron and served as a communications ship during the Battle of Endor. When Vader arrived at the Death Star II to put its construction back on schedule, his personal shuttle was launched from the Avenger. "The Avenger has achieved hyperspace terminus, sir. The fleet is assembled. We are ready to annihilate the planet on your command!" The Avenger survived the Battle of Endor and later fought during the Operation Shadow Hand. Under Executor Sedriss QL, the ship led the Imperial fleet in the Battle of Balmorra. Although first seen in 2 BBY, the Imperial II-class Star Destroyer wasn't introduced until 0 BBY. The Industrial Light & Magic model of the Avenger used in The Empire Strikes Back was 2.59 meters long and detailed with thousands of parts from model kits. Galaxy Guide 3: The Empire Strikes Back identifies the Avenger as the Star Destroyer that launched the Viper probe droid that discovered Echo Base. This appears to have been based on dialogue between Captain Needa and a subordinate that did not make the final cut of the the radio dramatization of The Empire Strikes Back. 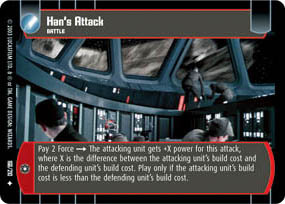 However, the Star Wars Customizable Card Game later contradicted this, as did the Star Wars Encyclopedia and the PC program Star Wars: Behind the Magic. These sources identify the Stalker as the Star Destroyer holding this distinction. 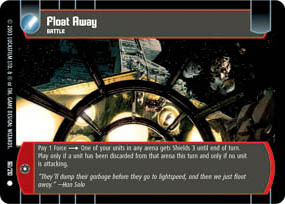 Further adding to the confusion, Star Wars: The Visual Dictionary also identifies the Avenger as the Star Destroyer that launched the probe droid. Attempting to clarify the discrepancy, The Essential Atlas states that both ships were responsible for deploying probe droids, though does not state with absolute certainty which ship is seen in the film. Star Wars: Behind the Magic also identifies the Avenger as the Star Destroyer that launched Vader's shuttle at the beginning of Return of the Jedi. Star Trek's ISS Avenger, a ship authored by Mike Sussman, was named as an homage to the Avenger. In the 6th mission of Battle 4 of Star Wars: X-Wing Alliance, "Protect Imperial Computer", one bonus objective is to destroy the Avenger. ↑ Star Wars Galaxies - Rebel Terminal Mission "Orbital Mines Bad"
↑ The Empire Strikes Back radio dramatization, Episode 1: Freedom's Winter.